If you visit India you'll find you have a wide choice when it comes to desserts but most either have a milk pudding or a sweet fudge-like base – rather like coconut ice.Most of these sweet puddings start off by boiling down milk before adding sugar dried fruits, nuts or spices. Wash the sago under running water until the water runs clear. Drain thoroughly.Put the milk, into a saucepan, and bring to the boil. Add the sago and return to the boil. Simmer, stirring, until the pudding thickens and the sago is cooked. Dissolve sugar in water. Add to the milk and sago and continue simmering until thick.Stir in the cashew nuts and raisins. Allow to cool slightly then serve warm. Flavour with cardamom and saffron if liked. Place the rice and water in a saucepan and bring to the boil. Simmer, covered, until the water is absorbed and the rice is tender. Meanwhile dissolve the sugar in the coconut milk. 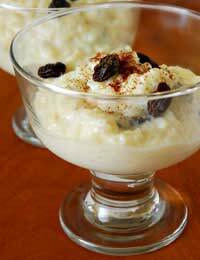 When the rice is ready, add the raisins, almonds and cardamom, along with the sweet milk. Stir carefully. Simmer, uncovered, for another 10 minutes or so, until the mixture has thickened. Allow to cool slightly then serve warm garnished with chopped pistachios. If this isn’t eaten immediately, it may become a little dry. In that case, add some milk and reheat. Using a large thick-bottomed pan, heat the milk to boiling point. Simmer, stirring constantly, for 40 minutes or until the milk has reduced to less than half. Remove from the heat.Add the sugar, ground cardamom and nuts and stir well. Leave to cool. Pour the mixture into small ramekin dishes and cover with Clingfilm or foil. Freeze until set.To serve, remove the kulfi from the dish by running a hot knife inside the edge. Tip out onto a small plate. Serve garnished with raspberry and pistachio nuts. Heat 1 tablespoon ghee or oil in a heavy-based pan. Add the coconut and stir fry it until it looks dry. Add the sugar and milk. Stir well and bring to the boil. Add the cardamom powder. Boil, stirring, until the mixture thickens. Add the remaining ghee and stir well. Pour the mix into a greased shallow tin. Leave to dry and then cut into squares. Place the grated carrots and milk in a heavy-based saucepan and bring to the boil. Simmer until most of the milk has disappeared. Add sugar and continue to simmer, stirring, until the mixture looks dry. Turn out into a shallow dish. Melt the butter in a frying pan and sauté the cashews and raisins until the cashews are golden brown. Sprinkle over the top of the carrot mixture. For extra flavour, sprinkle over a pinch of ground cardamom as well. You can puree the carrots instead of grating them if you prefer a smoother texture. Whisk the yogurt and sugar together until smooth. Strain this mixture through a muslin cloth to allow liquid to drain off. Put the yogurt in a large bowl. Strain the mango pulp through muslin. Add the drained pulp to the yogurt with the ground cardamom. Cover and chill in the fridge.Serve in individual dishes decorated with sliced pistachio nuts.